Hi everyone! 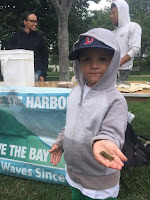 It's Tuesday week 3 at Camp Harbor View and we still have only caught one fish (and the tiny one we caught in the trap) unfortunately but some other exciting things have happened! So yesterday as the new set of kids came in for fishing club they were all excited to get their rods out and patiently wait for the big catch. We haven't had much luck lately with fish, but there has been a ton of crabs of course. So out of no where one of the kids named Max yells "I think I caught something! Help!" as his rod was bending and pulling. And of course, we all rushed to see what mysterious fish could have been at the end of his rod. "It's defiantly a big one!" We all took turns at pulling until finally we reeled and reeled up... and what did we see?.. A ginormous piece of seaweed! It was about 7 feet long and all the kids looked at it in amazement and wonder. Jen then helped us identify the tiny living creatures that lived on it and what their role was. The kid who caught it was even brave enough to pick it up and put it around his neck! Not only did we catch the seaweed scarf yesterday but today we caught something in the crab trap that surprised everyone. It was a lobster! It was very scary looking at first because I had never seen a live lobster that close up before just like some of the kids hadn't either. 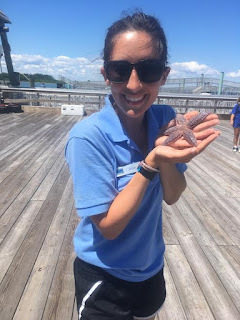 After a while of learning about them and how they get around by swimming backwards, I finally got the courage to touch it more although I still didn't get to hold it because they like to move around a lot! It was really fun because some of the kids held "Larry the lobster" and they had fun showing him around the dock and learning more about him. 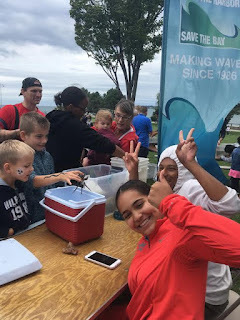 I love spending my Friday afternoons at Carson Beach because they're diametrically opposed to the well established routine-filled days at the Children's Museum; you just never know what's going to happen! This Friday the tide was out again, so after spending some time working on our boat art project (which is coming along quite nicely, if I do say so myself!) we ran down to the exposed sand goo to look for clams. By now, the kids are clamming professionals, and set right to it digging up clams. I, on the other hand, have proven myself to be an enthusiastic but not-so-successful clammer, and despite my best efforts, found myself empty handed. I decided that my clam-digging technique could use a little help, so I began to walk up to the bath house to grab a rake so I could dig a little faster. I was halfway through the not-so-pleasant part of the beach where the texture of the sand changes from a fine silt to sharp, pointy rocks, when I heard something fall next to me. Startled, I turned to see what had just made an aerial descent into my personal space - a clam! Knowing that the chances of this clam falling directly out of the sky were quite slim, I looked about, suspecting that a Junior Program Assistant had thrown it at me. I almost immediately locked eyes with the culprit: a seagull, who had seemingly hurled this clam to the ground in efforts to break it open and eat the insides for lunch. Well, seagull, tough luck, because I had spent close to 45 minutes up to my ankles in sand looking for these bad boys, and I was determined to have one for myself. The seagull and I locked eyes, and I could see in his beady little pupils that he also felt entitled to this clam, and was quite determined to have it for himself, completely disregarding my intention of using the clam as a tool for scientific exploration and learning. Rude. After what could have been seconds of eye contact, we both simultaneously made our move: the seagull defiantly waddled towards the clam, but I am, obviously, bigger and faster, and snatched up the clam for myself. Another day, another victory! After the kids had lunch and I spent some time admiring my hard-won prize, we grabbed some rakes and headed back down to the shoreline to make some art designs in the sand. 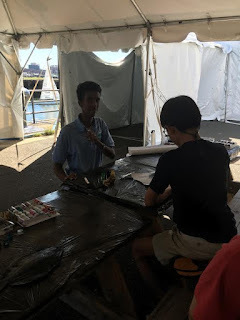 The kids experimented with writing their names, drawing self portraits and fish, and creating geometric designs. Some of the kids decided that making art wasn't quite their speed, so instead used the rakes to engineer a system of dams and aqueducts. It was an awesome opportunity to get to talk about the rising tide and the structural integrity of sand as the kids tried to see who could get their "pool" to fill up the fastest. To be completely candid, there were some truly impressive feats of engineering out on that beach, and I'm hoping to see if we can use those skills to build even better aqueducts next week! The day unfortunately had to come to a close, but it was filled with surprises, adventures, and a whole lot of laughs. And if you were wondering what became of my hard earned clam...a kid broke it open to see what was inside it as soon as I walked away from it. This weekend I was fortunate enough to work an event at the Hull Illumination night, which is a really cool event that culminates in a lighting of the Boston Harbor with road flares spaced evenly along the Hull shoreline, which is extremely beautiful. Having many friends in Hull, I've gone to this event as a member of the public many times, but this is the first time that I've ever worked it. I was actually not supposed to even work this event, but due to high winds the event I was meant to work was cancelled, so I was lucky enough to go to Illumination Night. 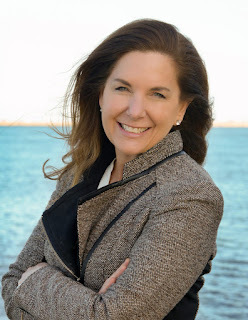 I was very excited to be able to work this event, as it is near and dear to my heart, and though the weather was less than ideal, and we may have had fewer guests than we would have liked, I fully enjoyed the experience. 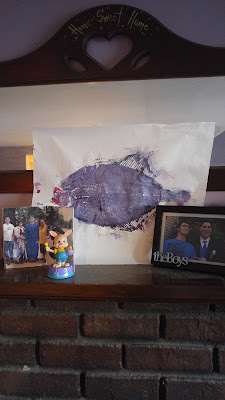 As usual, our team comprised of myself, Briana, Garrett, Eric, and Jaiden, found ourselves doing some fish printing for the great people of Hull. As usual, I found myself silently delighting every time people realized it was, in fact, a real fish that we were using. The reactions always range from disgust, to fascination, to fear, and more. It was funny watching one young girl timidly poking the fish with her bare finger and then jumping back as if it would react in some way. Of course, we made sure to teach everyone about the life cycle of a flounder, and how it begins with eyes on both sides of its head in its larval stage. Once it metamorphoses into its juvenile stage, one eye migrates to the other side, and the flounder goes from being bilaterally symmetrical, to asymmetrical and swimming with one side on the bottom of the ocean floor. 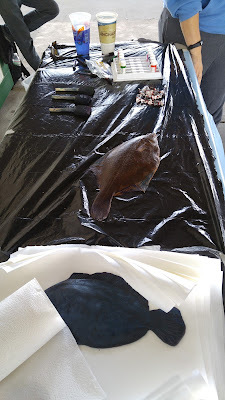 If you already knew this, chances are you're a marine biologist or have attended one of our fish printing sessions. If you did not already know this, then congratulations on your new fun fact! As I mentioned previously, our guest count was lower than I would have liked, likely since it was cold and a bit overcast. However, we still had many quality visits, but two in particular stood out to me. The first was a visit from my parents, where my mom was able to do a fish print. It was nice to be able to share the work I've been doing this summer in a way with them that is not simply a story, but the real deal! The other was a young girl who came by and asked how much it cost to do a fish print. When we told her it was free, and she could do one, she excitedly ran back to her mother, and while I couldn't hear what she was saying, you could tell she was over the moon with the idea. 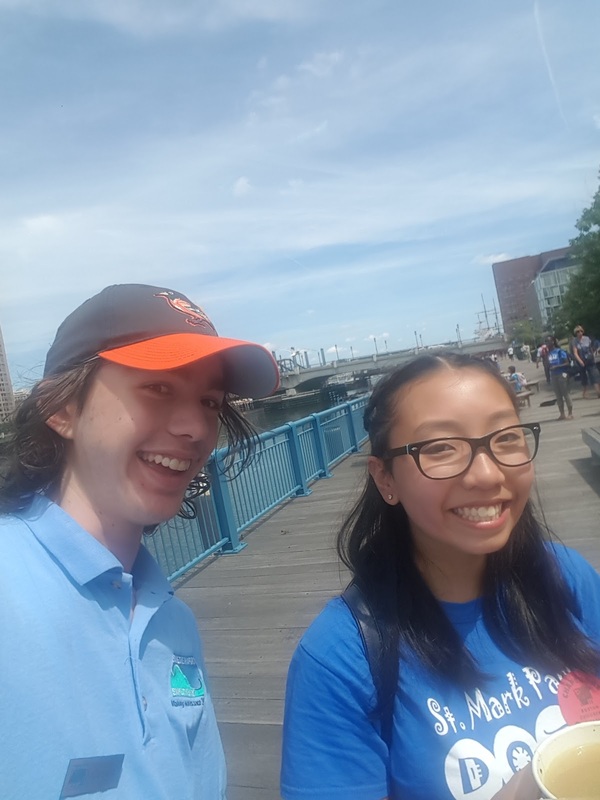 And I am over the moon with the idea that we were able to in some way engage this girls excitement over the meshing of art and science, which of course is the entire point of our work here at Save the Harbor. Until next time, when there's a slight chance one of my eyes will have migrated! We caught a fork and some sea creatures on our line. My first day working at Children's Museum was amazing! Everyone has tons of fun and we were all able to enjoy the beautiful summer weather. I arrived at Children's at 1:45 which is when we typically get the most visitors. For about an hour straight all our fishing rods were in use and there was at least one kid looking at the crab in the fish tank. During this time two visitors were able to catch a crab using their fishing rods! Sadly the crabs let go of the line both of these instances, and we weren't able to reel them in. The kids didn't seem to mind, they were just excited they got something on their lines. The View from Children's Museum. Later in the afternoon Rusenny, Vince and I started playing a very competitive game of four square. Soon enough we were able to get some of the kids that were just fishing to join our game. They spoke limited English so it was somewhat difficult to explain the rules, but they caught on quickly and then all four of us were able to enjoy a nice game of four square. Everyone was laughing and competing, which was great to see. Look who I found! ITS MY FRIEND!!!! Let me set the scene. On Friday, I was pulling up one of the crab traps when I just hear "Garrett! Garrett! Garrett!!" and meanwhile, the crab trap had just gotten to the top of the railing. In the back of my head, I thought "wait... I know that voice!" turning around I see a group with blue shirts on, and at second glance I saw "Saint Marks Parish" and I'm a parishioner there! After a few second I see someone I knew! Waving at me, I see one of my friends from church calling me. Now with my great mind I think of the greatest thing to say, "OH MY GOD VIV! WHAT ARE YOU DOING HERE!?" and ran over to say hi and hug. At that point it had been soooo long since we had seen each other. It was just about 5 days. And I learned that she had been volunteering for that camp, which I had no clue existed, for three weeks without my knowing. And the greatest thing was, she thought I knew! Now I know what you may be thinking, "Garrett? What in gods green earth do you think your doing at work???" and to that I say this: having fun and teaching kids! I took the opportunity to bring over a crab to the group showing it to the kids and teaching them a little bit about the green crab, like how to identify one and how to tell the gender. I was able to get quite a few of the kids to touch the crab, but not all of them... I truly think I was lucky that day, due to us having a pregnant crab at the time, and I was able to show them crab eggs and where they were held. 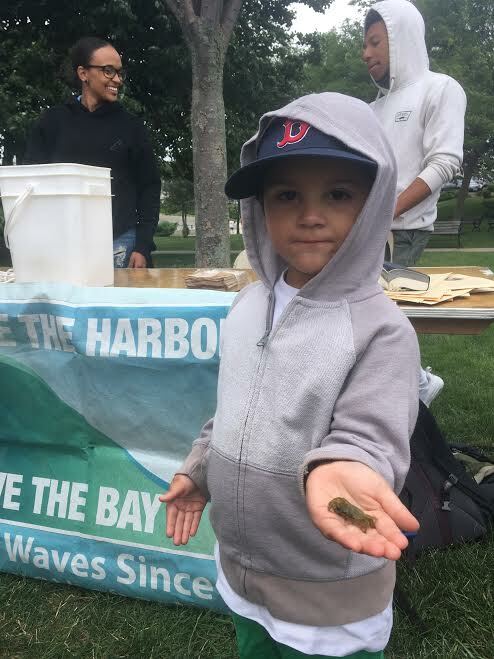 I'm hoping that through out the course of the rest of the summer, I am able to continue teaching people about fish and crabs that live in our harbor that we so very deserve. campers to me new friend! This last week on All Access was a blast! My team and I spent it on Georges Island, familiarizing young campers with their harbor and the many creatures that live in it. Fishing off the pier yielded more crabs, surprising I know. The kids delight in reeling them up, and the best part is letting them investigate their catches in our touch tank. The young children are usually timid towards them at first, but it's not long after after seeing my associates and I pick them up and learning a little bit about their anatomy and life cycles that they perk right up and begin asking to touch and hold the crabs themselves. I enjoy seeing the kids venture from their comfort zones and get hands on with the sea critters; they always bunch up their little faces, almost as if they can't believe they're holding a real live crab in their hands! We educate campers and counselors alike! The children love fishing so much, I know they would do it all day long if they could. Often times groups of them will stay for a couple sessions and I have to encourage them to get out and explore the island! I myself was able to explore the fort housed on the island, with its pitch-dark tunnels and legendary "Lady in Black". I walked in with two little girls I had seen sitting outside of one of the tunnels too scared to venture inside. We held hands as we tried to navigate through the darkness, but even with them being arms-reach from me I could not see either of them. The farther inside the dark tunnel we got, the harder they began to tug on my hands trying to reverse our direction. I was pleading with them to continue onward until we had reached the back wall, but then I heard a scream come from right next to me and I was unaware there was even a person in there with us! Suffice to say all three of us bolted out of there screaming bloody murder until we had reached the safety of the sunlight. A part of me is still disappointed I didn't reach the end of tunnel, I know deep inside that I have what it takes-- I will have to fix that on our next trip back! 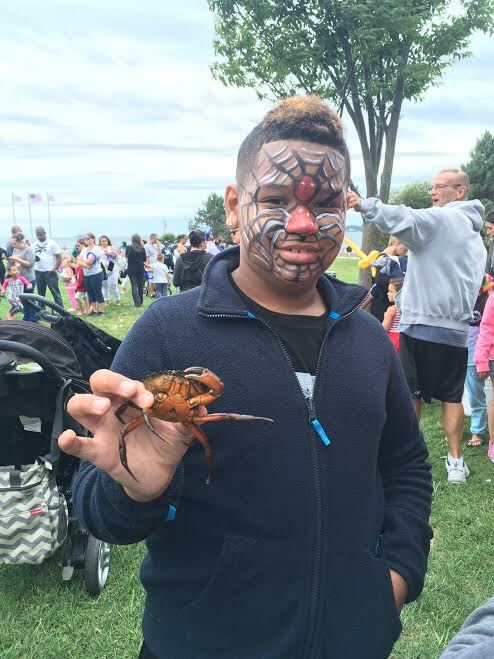 This Saturday I had the pleasure of working at the Kid’s Day Festival at Red Rock Beach in Lynn. Early in the morning Jahari, Patrice, Jennifer, Kimberly, and myself loaded into my car and stopped at the Courageous Sailing Center. Our first order of business for this event was to collect crabs from the traps we have at Courageous. We picked a few lucky green crabs from the traps and took them on a lovely car ride to the festival. When we arrived, we set up a large touch tank with the crabs we collected earlier. 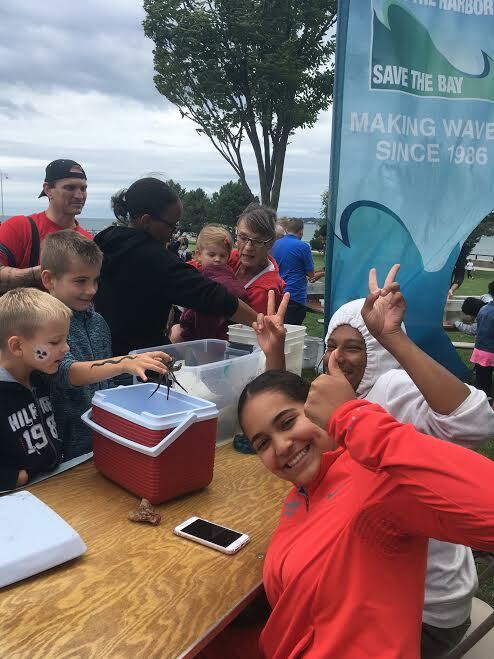 While Jahari, Kimberly, and Jennifer were collecting ocean water for our tank, they also found a handful of periwinkle snails, a few small hermit crabs, a small bright green crab the size of a quarter, and a crab who had just molted. I had never seen a freshly molted crab and was very excited to examine his soft exterior. We placed the new-found creatures in a bucket next to our tank and soon enough, the children came rushing in. It was a very windy day, but the wind could not blow away all of the excitement. There were bubbles in the air, balloon animals floating about, and Disney songs pouring out of the speakers. Because our table was right at the beginning of the park, we were constantly busy showing the kids our cool collection. A lot of children loved the tiny green crab because he was so small and had tiny pinchers. Still, there were many brave children who jumped at the chance to hold a large crab for the first time. 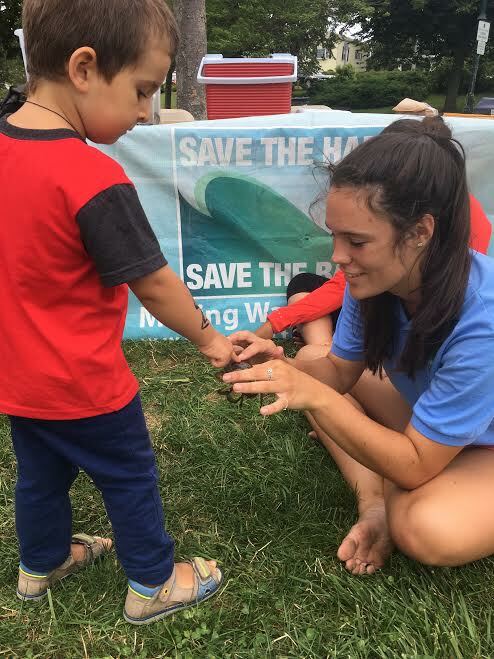 Even some adults got over their fears and held a squirmy crab. We had a few crab races on the table and the hermit crabs became bold enough to run around as well. One hungry baby thought a periwinkle snail looked pretty delicious, but we saved the little snail from becoming a snack! Once we were done at the event, it was time to release the crabs back into the ocean. 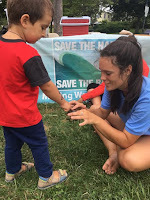 A few kids volunteered to help us and had a great time saying bye to our ten-legged friends. We also took a couple minutes to explore the tide pools before it was time to head home. Even though this was an event for kids, I had a fantastic time. I guess I am still a kid at heart!